MARX ALAMO 54 MM MEXICAN SOLDIERS - METALLIC BLUE- Lot of 16 in 06 POSES - LOOK! scratch-x has no other items for sale. MARX? Multiple Products Co? 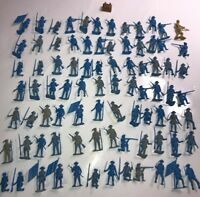 REVOLUTIONARY HUGE lot of 80 Blue vintage soldiers! Please see item description for full payment instructions. If you have purchased multiple items please wait for me to send you a combined invoice. Thank you!